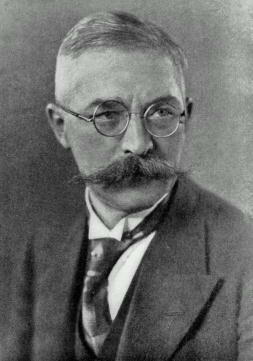 Alfred Witte was an outstanding German astrologer of the early 20th century and the founder of the Hamburg School of Astrology who wrote over 40 articles as well as the first "Rules for Planetary Pictures" . He was also a land-surveyor who worked on the Hamburg airport. In his private life he was an unpretentious, withdrawn man. He was married and had two daughters. Witte began his career as an astrologer in 1913 when he published his article "Thoughts on Colour, Number, Tone" , where he developed the ideas of Johannes Kepler, his compatriot, an astrologer and mathematician, particularly on the idea of harmony or the music of the spheres. This article discussed the mutual interrelation of planets' vibrations, as well as their relation to other natural oscillations and waves according to the tuning fork principle. But this article only was his first probing step. During the World War I, Witte was summoned to the Russian front, where he tried to forecast moments of artillery bombardment, but suffered a shattering defeat. Having realised the insufficiency of classical methods, he began to search for his own approaches to obtain practical results. Ultimately, he found them, and thus caused a revolution in astrology of the 20th century, in the same way that Kepler in the 17th century, who had discovered the laws of celestial mechanics, created the most precise ephemerides of his era and worked out a new theory of aspects based on music theory. Today few people know that it was Kepler to whom we owe the aspects of 72°, 135°, and 144°, angle analogues of three consonances not used by Ptolemeus -- major third, minor and major sixth. Later, Kepler's contribution to astrology was almost forgotten, and the original musical theory, underlying the new aspects' introduction, was ignored. Seventeen years after Kepler's death, William Lilly, in 1647, in his "Christian Astrology"  added the aspects of 30°, 36°, 45° and 108°, corresponding to discordant musical intervals that obviously contradicted the tuning fork principle. From 1919, Witte, being a member of the Hamburg "Kepler Circle", started lecturing astrology. In his lectures he disseminated his revolutionary views and ideas for the first time. Later, on October 31, 1925 at 9:45:51 PM MET (GMT+1:00) in Friedrich Sieggrün's house (9E57'24" 53N33'04") the Astrologers Union "Hamburg School" (Astrologen-Verein "Hamburger Schule") was founded. It was a precursor of the Hamburg School Astrological Study Group (Astrologische Studiengesellschaft Hamburger Schule E.V. ), founded on December 27, 1947 by followers including Wilhelm Beckmann, Conrad, Hellberg, Hermann Lefeldt, Karl Perch, Herbert Pauels, Ludwig Rudolph, Heinz Schlaghecke, Wilms, and Schacht, with the aim of studying of Witte's legacy. Unlike Kepler, Witte proposed rejecting aspects, and to determine the relations between planets and points according to the formula: a + b = c + d, where a, b, c, d are the planets' coordinates, expressed in absolute degrees. The idea is brilliantly simple, and gives the astrologer a powerful instrument for checking the inner workings of the chart. Different modifications and simplifications of the formulae create "planetary pictures" (Planetenbild) of varying strength. For example, if we suppose that a = b, that is a and b are the same point, then the original formula assumes the following form: 2a = c + d or a = (c + d) / 2. It means that the a point is situated right in the middle between c and d, that is in the "midpoint" (Mittelpunkt) between them. The strongest planetary picture is produced when we suppose that a = b and c = d. Thus, the original formula is reduced to a = c, which means the conjunction between points a and c. The sign of equality in those formulas may not be an equality in the strict mathematical sense; planets may be 360° or 180° apart, yet we still consider them "equal"; thus the a = c formula can signify not only a conjunction, but possibly also an opposition. Witte took into account all midpoints or differences aspecting any given point or planet by 90° or 270°, and today the Hamburg School extends this to include aspects of 45°, 22.5° and even 11.25°. We shall briefly explain this scheme. From a philosophical viewpoint, the assumption is that the world consists of "Ego" (Me) and "non-Ego" (You). If we consider these two opposites at three levels (body, soul, spirit), we shall get six main points, which give us an idea about an individual person and his/her interaction with the world. These six points present us the key to all the forthcoming horoscopes and their analyses. Witte solved the problem of house systems in an even more revolutionary way than the question of aspect systems . He proposed to use an Equal House system, taking six personal points in turn as the starting reference points, and developing six different house systems. He explained the choice of Equal House system by the fact that it was the only natural angle coordinate system, and all the house systems that cannot be reduced to it were to be discarded. The original character of such an approach is that only the ASC and Moon's Node are taken to be the cusp of the first house of the Equal House system. The corresponding horoscopes are called Ascendant and Node house charts. The coordinates of the Moon and MC are taken to be the cusp of the 10th house and are called Lunar and Meridian horoscopes. The Sun is taken to be the cusp of the 4th house in the Solar horoscope, and 0° Aries is taken to be the cusp of the 7th house in the Earth horoscope. Thus, having six horoscopes, and correctly synthesising the information taken from them, one can describe the complexity of processes existing between man and his environment with great precision. Besides that, Witte used not only the 360° scale, but its harmonics as well, especially the 90°, where the whole circle is considered to be equal to 90°; and where all the planets situated 90° or 180° from each other form a conjunction on this circle. Harmonic charts made it possible to analyse aspects in an even deeper way with application of the formula a + b = c + d in all its variant harmonics, despite the seeming rejection of aspects. Peculiar to Witte's achievement was an invention of the 360° Dial, that made it easy to draw a horoscope, analyse it in different Equal House systems, and search for the planetary pictures. One more of Witte's innovations of no less importance was four, and later eight transneptunian planets (Transneptuner, TNPs), which are called Uranian planets in the US. The first four planets were calculated by Alfred Witte himself, and the rest were calculated by his student and collaborator, the founder of the Hamburg "Kepler Circle", Friedrich Sieggrün. The first discovered transneptunian was Cupido, the planet of marriage and family. Witte's was concerned with the fact that at the moment of marriage, the directed MC or Moon (meaning the direction of the solar arc, approximately 1° per year) must aspect another planet. And when there was no such planet, Witte made a supposition that this person must have a yet undiscovered planet at this place. While comparing many horoscopes with the known date of first marriage, it was found, that for people of similar age all these "missing" points were situated very close to each other. In this way, the first version of Cupido ephemerides was created. It was followed by other planets: Hades, Zeus, Kronos, Apollon, Admetos, Vulcanus and Poseidon. The table below shows symbols, periods of circulation, key words and concepts, used for their explanation [the sources are 1, 6, 7]. I would like to draw special attention of the reader to the fact, that Witte himself actively used only the first four transneptunian planets (Cupido, Hades, Zeus and Kronos), and the other four, calculated by Friedrich Sieggrün, were included together with Pluto in the classical books of the Hamburg School, such as "Rules for Planetary Pictures", only in 1947, six years after Witte's death. The external ruler shows what the sign looks like from the outside, and the internal one shows what happens inside of it. If we extend this scheme logically, the four TNPs, discovered by Sieggrün, will rule: Apollo -- Gemini and Virgo , Admetos -- Taurus and Libra , Vulcanus -- Aries and Scorpio , Poseidon -- Pisces and Sagittarius . Later, in 1930, when Pluto was discovered, and in 1938, when its first astrological ephemerides  were published, this factor had to be included into astrological schemes. Witte had insufficient time to do it since he died in 1941, but his followers, without thinking twice inserted the new planet together with Neptune in Scorpio and Aries , having left the Cupido to rule Libra and Taurus . If Witte were alive, most likely he would reconsider his views, and would qualitatively reform TNPs (their ephemerides and cycles) with the consideration of Pluto. But, unfortunately, his life ended tragically. Hitler, having come to power in Germany, prohibited activity of the Hamburg School, and Witte and his family were threatened by internment in a concentration camp. It lead to his suicide in August of 1941, thus hoping to save his family from repression. The majority of his students were sent to concentration camps, but the most faithful ones carried in their hearts through the hell and flames of World War II the name of innovator astrologer Alfred Witte, and the knowledge of his unique system that is truly revolutionary even today, almost half a century after the death of its author. As we said above, thanks to those Witte's followers, who stayed alive, the Hamburg School of Astrology was restored. Still, many astrologers who followed the ideas of Witte, were not satisfied by their concrete realisation, and began to develop and supplement the original set of methods of the Hamburg School. The farthest in this direction was Reinhold Ebertin, the father of Cosmobiology, an methodology popular in the US [see, e.g., 9]. Having rejected many ideas of Witte, he constructed his system exclusively on harmonics and midpoints, with which he made the techniques much simpler and less divergent from already popular astrological techniques. Due to this, Cosmobiology got much wider dissemination and recognition than the Hamburg School. Richard Svehla and then Hans Niggemann began to popularise Witte's ideas in USA as "Uranian Astrology" or "Uranian System", but later Niggemann also started introducing of changes and corrections which seemed to be valuable to him, and called his techniques "Uranian System of Astrology". As a result, the Hamburg School for a long time left him in isolation and obscurity. Unfortunately, this situation seems to remain today. Discussing the revolutionary ideas of Alfred Witte, one can not help noticing the archaic level of their practical realisation, both in Hamburg School and in all subsequent branches, which, in fact, did not really bring about anything new. The main drawback of Hamburg School's methods is connected with their attachment to ecliptics, while Witte discussed the idea of six personal points, and of the six horoscopes  in indissoluble connection with the necessity to consider them in different planes -- ecliptic, equator, prime vertical, and so on. The middle points and other connections according to the formula a + b = c + d also can not be realized in one single dimension. For example, if we convert the formula 2a = c + d into a - c = d - a, the angle (a - c) may well lie in one plane, and (d - a) may well lie in another one. Harmonic charts are consonances in relation to the original horoscope, and therefore they are a mere technical expedient for a more detailed analysis of aspects in the Keplerian sense. It is no doubt that Witte consciously simplified the realization of his ideas, for them to be easily applicable -- at his time there were no ordinary calculators, to say nothing about computers! Witte's refined ingenuity in the task of tabulation, simplifying the complex astronomical calculation to the ordinary operations of addition and subtraction, deserve a special mention. Still, we must take into consideration the fact that today, having advanced electronic calculators in the form of computers at our disposal, we can realise his ideas, which, according to his contemporaries, were to turn astrology into a real science in an absolutely new way. Black dots mark the discovered planets from Mercury to Pluto. The curve, drawn through them is a smooth approximation of this dependence . Transneptunian planets of the Hamburg School are marked by square marks on the scheme. As you can see from the drawing, the first four transneptunian planets, calculated by Alfred Witte himself, are situated close enough to the smooth curve, and the last planet of Kronos is very close to it. It can be seen from the scheme, that the hypothetical Cupido is really the approximately calculated Pluto, because the difference in their cycles is not far more than 10 years, and the ephemeris of Cupido in the 20th century differs from the ephemeris of Pluto no more than half a sign at average. As for the planets calculated by Friedrich Sieggrün, they can not be put into accordance with any smooth approximation, thus proving an evident mistake in determination of their cycles; but, possibly, because of the very slow orbital motion, their empirical ephemerides calculated by Sieggrün have acceptable precision. But if there are 14th, 15th, 16th and 17th planets in the solar system, they must have significantly larger cycles, vividly expressed by the above scheme. According to the smooth approximation shown in it, the cycles of transplutonian planets must be approximately equal to 346 (Hades), 440 (Zeus), 530 (Kronos), 617 (Apollon), 699 (Admetos), 777 (Vulcanus) and 856 (Poseidon). And according to the latest astronomical data, received by American astronomers with the help of the Hubble Space Telescope (HST), there is another asteroid belt behind Pluto (about 346 years), because the number of discovered distant asteroids with cycles from 270 to 330 years already have been counted at more than 40. That is why the existence of Hades as a planet is put under question. Nevertheless, it's quite possible that the one of the biggest planetoids of the transplutonian asteroid belt was astrologically discovered as "the planet" Hades. In conclusion, it's necessary to say that Alfred Witte was one true astrologer who has combined in his works an innovative approach with deep knowledge and understanding of classical astrology at the level of modern sciences such as mathematics, astronomy, and physics. Today his works have not lost their applicability at all, although more than a half a century has passed since the moment of their publication. At this time, Albert Timashev and Yuri Karpenko have initiated and successfully implemented the Translation Project of all works by Alfred Witte into Russian. This Project is finding an active support and understanding from Germany in the person of Udo Rudolph, today's leader of the Hamburg School of Astrology. Participants to the Project hope that Alfred Witte's works will find a lively response from Russian-speaking astrological community. We'd like to suggest our English-speaking friends should initiate the same Project and translate Alfred Witte's works into English. You'll find every possible effort and assistance from our part in its implementation. Alfred Witte, Regelwerk für Planetenbilder: Die Astrologie von morgen. Hamburg, 1928. (English translation: Witte-Lefeldt, Rules for Planetary-Pictures: The Astrology of Tomorrow, Witte-Verlag, Hamburg, Germany, 1996). Alfred Witte, Betrachtungen über Farbe, Zahl, Ton. Astrologische Rundschau, IV Jahrg., 1913. A. Witte, Sensitive Punkte. Astrologische Rundschau, X Jahrg., Dez. 1919. William Lilly, Christian Astrology, 1647. Ludwig Rudolph, Bedeutung der Planeten in den Häusern. Ludwig Rudolph (Witte-Verlag), Hamburg, 2.Auflage, März 1974. (English translation: Ludwig Rudolph, Meaning of the Planets in the Houses: The theory of the houses according to WITTE, Witte-Verlag, Hamburg, Germany). Robert A. Jacobson, The Language of Uranian Astrology, Uranian Publications, Inc., 1990. The Influence of the Planet Pluto: Including an Ephemeris of Pluto, 1840-1960. Chicago: Aries Press, 1938. 26 pages booklet. Reinhold Ebertin, Kombination der Gestirneinflüsse. Ebertin-Verlag, Aalen/Württ. Erweiterte Neuauflage 1961. (English translation: Reinhold Ebertin, The Combination of Stellar Influences). Albert R. Timashev, "Generalized Golden Section and the Time Theory", report at the International Scientific Conference "New Ideas in Natural Sciences", St. Petersburg, Russia, June 1996. Udo Rudolph, Alfred Witte and Hamburg School of Astrology (article). Regelwerk - Neufassung von Ruth Brummund. Ludwig Rudolph (Witte-Verlag), Hamburg, 1.Auflage, 1979. Udo Rudolph, ABC für Planetenbilder. Deutsche Erstauflage 1996. Udo Rudolph Verlag, Hamburg. If you have any comments or suggestions, please, E-mail webmaster.